The nationalists lost Thursday’s referendum. So why are they still ‘winners’ in a political sense? To think that the ‘Yes’ campaign was trailing by a margin of 20% in early August, it’s something of an incredible result that the ‘No’ campaign won by such a small margin. Of course, it’s certainly heartbreaking for the nearly 46% of Scottish voters who chose independence. But when you think about where the independence camp started off, it’s clear that Scottish nationalism, as a cause, has made incredible gains since British prime minister David Cameron and Scottish first minister Alex Salmond agreed to the terms of the referendum in March 2013. In coming so close to ending the 307-year-old union, Scots forced Cameron and the political mainstream to offer what Cameron refused to even consider placing on the referendum ballot 19 months ago — even greater devolution for Scotland. The close result means that, while there won’t be another referendum anytime soon, Scottish nationalists will kindle the dream of independence for another day. Ultimately, that may bring Salmond’s Scottish National Party (SNP) more support in the next two decades than if, suddenly, the SNP woke up today having suddenly achieved its raison d’être. 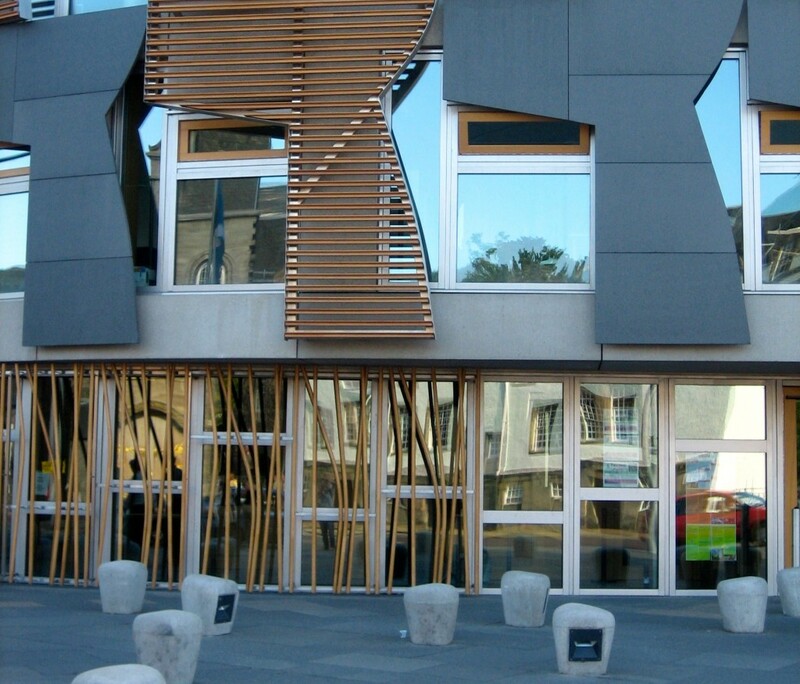 Holyrood, which was already set to gain additional powers in 2016 after the Scotland Act 2012, will now almost certainly receive even greater autonomy. 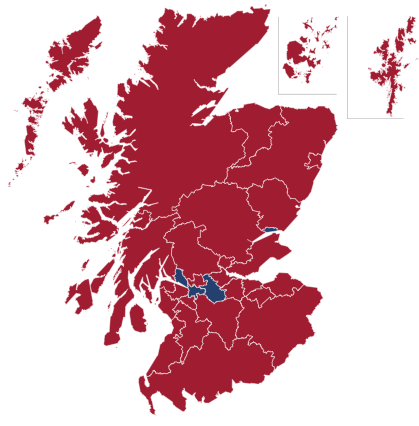 RELATED: If Scotland votes ‘No,’ what will devolution-max entail? Cameron, Labour party leader Ed Miliband and deputy prime minister Nick Clegg, the leader of the Liberal Democrats, are all on record in support of ‘devo-max’ — maximum devolution of powers to Scottish local government. It could potentially mean that Scotland will have near-complete autonomy in traditional ‘domestic’ matters like spending and taxation, and Scotland may even be able to borrow more money in international markets. Though there’s sure to be some English backlash, and though Scotland hasn’t even used its devolved powers as much as you might have expected over the past 15 years, the Scottish parliament is certain to become much more powerful, possibly by the time of the next British general election in May 2015. Was there any more effective advocate for Britishness than former prime minister Gordon Brown? In the early summer, Brown, who wrote an entire book making the case against Scottish independence, emerged as the clearest champion of the ‘Better Together’ campaign. With Cameron unpopular and the Conservative Party brand toxic in Scotland for decades, and with the Liberal Democratic brand wrecked after working so closely with the Tories, it fell to Labour to make the strongest case for unionism. But as the ‘Yes’ campaign gained ground in the spring and summer, it became clear that Scottish Labour supporters were emerging as the key swing constituency. Alistair Darling, Brown’s former chancellor, officially led the ‘Better Together’ campaign, facing off against Salmond in two landmark debates in the late summer. But it was Brown who may have swung the ‘No’ campaign to victory, and not just for his majestic pro-union speech on Wednesday. In making the strongest case for the British union, Brown deployed all the gifts he seemed to lack as prime minister and in the 2010 campaign — sincerity, passion and conviction. It was Brown, moreover, who realized months ago that the referendum would undoubtedly force Westminster to devolve further powers to Holyrood. And it was Brown who realized, through months of the ‘No’ campaign’s complacency, just how powerful the allure of independence could be. 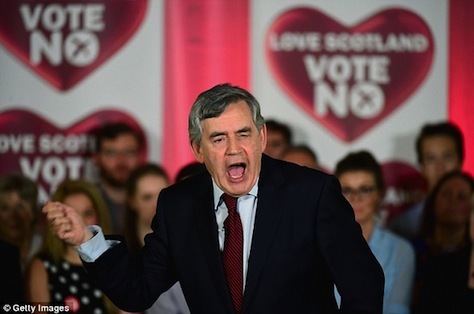 Whatever you think of Brown’s premiership and his decade-long stint as chancellor, his role in convincing Scottish voters to stay within the United Kingdom might be his most lasting legacy. In the final days of the campaign, as Cameron pledged ‘devo-max’ and pleaded with Scotland not to break away from the rest of the United Kingdom, English Tories didn’t even wait until the votes were cast to start grumbling about special treatment for Scotland. Among their concerns are that Cameron is willing to grant further autonomy while maintaining the ‘Barnett formula’ from the 1970s that guarantees greater per-capita spending in Scotland (and Wales and Northern Ireland) than in England. Since the Scottish parliament’s foundation in 1999, English nationalists have also grumbled about the underlying unfairness that, while English MPs have increasingly little voice in setting Scottish policy, Scottish MPs have as much voice as ever in setting English policy (the so-called West Lothian question). 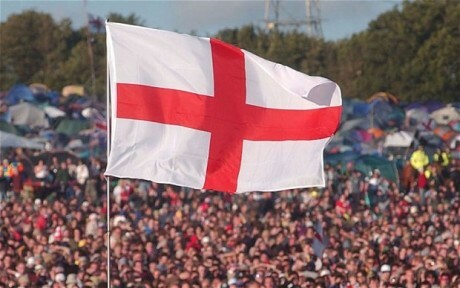 ‘English votes for English laws’ has long been a rallying cry for English nationalists, but it’s not clear that Labour, which won 41 out of 59 Scottish constituencies in the last election, would support limiting Scottish, Welsh and Northern Irish votes in the UK parliament. Cameron has hinted that, as soon as Friday morning, he will outline new plans to address English concerns, even as he remains committed to devolving further powers to Scotland. 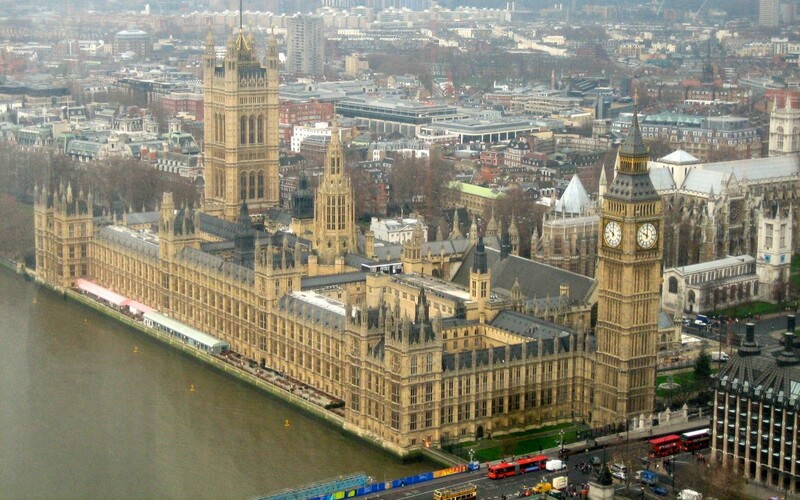 Amazingly, constitutional reform will now leap to the top of the Tory government’s agenda. I don’t think we want to go down the route of an English parliament as has been commonly understood … But the critical thing, I think is that there needs to be change in order to ensure that Westminster works better for the people of England and Wales and Northern Ireland. Unless it’s part of a wider constitutional or federal settlement for the United Kingdom, it’s hard to see how Cameron’s England proposals will win as much support as devo-max. But the reaction from English voters could be fierce, and it could give Nigel Farage and the right-wing, eurosceptic United Kingdom Independence Party (UKIP) a perfect domestic politics wedge issue. In light of the expectations throughout the campaign that ‘Yes’ supporters would lose, the narrow vote is a good enough result for Salmond to keep his job as first minister — and probably good enough for him to seek a third consecutive term in the 2016 Scottish elections. RELATED: Who is Nicola Sturgeon? Though tonight will be a difficult defeat for Salmond, age 59, the future of Scottish nationalism belongs to deputy first minister Nicola Sturgeon, age 44. No matter what happened in the referendum, Sturgeon was always likely to emerge with her stature enhanced. An able leader of the pro-independence camp, Sturgeon may have been crucial in winning over female and younger voters to the ‘Yes’ side. More leftist and social democratic than Salmond, Sturgeon is keen on pulling Scotland more toward the Scandinavian social welfare model, and that’s made her an incredibly popular figure, both within the SNP and more generally across Scotland. Though the Scottish Green Party lost all but two of its seats in the Scottish parliament in the 2007 election, its co-chair Patrick Harvie has always been a rising star in Scottish politics. The party, which supported independence alongside the SNP, is having something of a resurgence in Scottish politics, after winning over 8% of the vote in the European elections last May, and polls show it might win around 10% in the next Scottish elections. An openly bisexual leader, Harvie began his life in public service working on men’s health issues and HIV prevention before his election to the Scottish parliament in 2003. 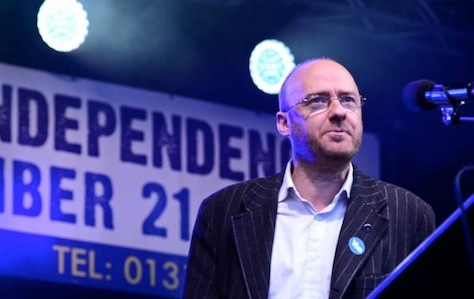 As the most prominent leader of the ‘Yes’ campaign from outside the SNP, Harvie played a significant role boosting the enthusiasm among civil society and among voters who usually don’t get involved with the political process. To the extent the referendum campaign became an exercise in the most fundamentally pure and engaged form of democracy, Harvie played a positive role in it. The Conservative prime minister may have won the vote tonight, and he looks increasingly likely to win the next general election in May 2015. But make no mistake, he came within 5% swing of becoming the prime minister who presided over the breakup of the United Kingdom, and that’s now certainly going to be among the chief legacies of his premiership, even if he wins reelection and renegotiates British membership in the European Union in 2017. Hindsight is 20/20, of course, but everything about the referendum indicates that Downing Street never quite took the campaign seriously, until it was almost too late. All of Cameron’s decisions in the 2012 and 2013 negotiations over the referendum are now subject to criticism. 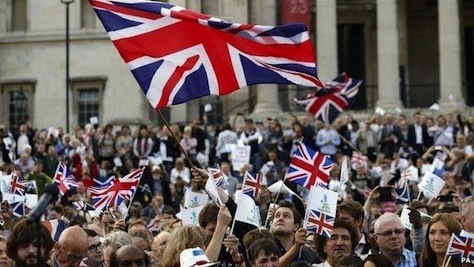 Why did Cameron allow the unionist cause to be defined as the ‘No’ option? Why didn’t Cameron simply allow devo-max as a third option? 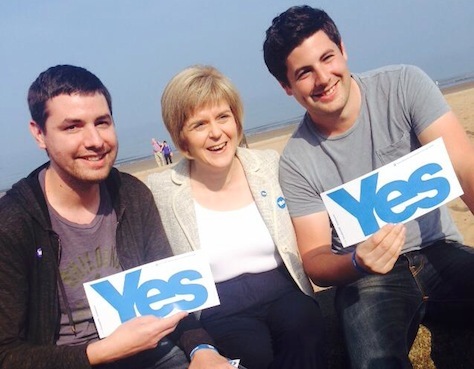 Why not allow Scots living in London and elsewhere the chance to vote in the referendum? Why permit 16- and 17-year-olds to vote? 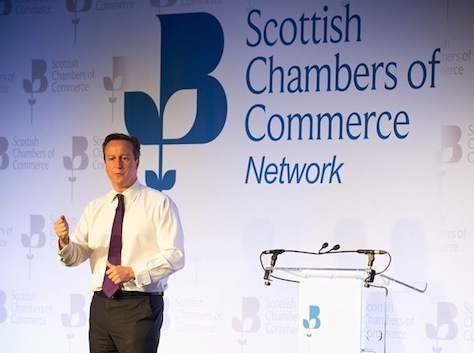 Fast-forward 19 months, and the entire nation witnessed Cameron pleading with Scottish voters not to choose independence just to ‘give the effing Tories a kick.’ In promising devo-max to Scottish voters, Cameron has never looked weaker, reassuring Scots that he wouldn’t be prime minister forever. His enemies inside the Conservative Party may begin to agree. Scotland didn’t vote to separate, Cameron will remain prime minister, and he will almost certainly lead the Tories into the next election. But there’s plenty of unforced error that Cameron could have easily avoided. All three major British parties lined up behind the ‘Better Together’ campaign. Nearly every major newspaper in Great Britain, even in Scotland, backed unionism over Scottish independence. In the final days of the campaign, it seemed like every business leader, banker and industrialist emerged from the background to declare the manifold risks that could befall an independent Scotland. It will certainly be interesting to read, in 30 years’ time, the archived conversations among Downing Street, the City and the British media and industry in the last week of the campaign, because they mounted what was almost certainly a concerted effort to erect a wall of fear to warn Scotland against independence. Even in the face of all that, Scotland came uncomfortably close to backing independence. If the British political, media, finance and business establishment cannot close the deal on something like Scottish independence, it’s even harder to have any confidence that Cameron, in a second-term referendum, can hold back the tidal wave of anti-EU sentiment that could result in the United Kingdom’s withdrawal from the European Union in 2017. Did anyone seem less relevant to the debate on Scotland than Miliband, the Labour leader who hopes to become the next British prime minister in just eight months’ time? Aside from Brown (see above) and the leader of the Scottish Labour Party, Johann Lamont, the entire Labour leadership seemed irrelevant and impotent throughout much of the campaign, including its final, fantastic climax. 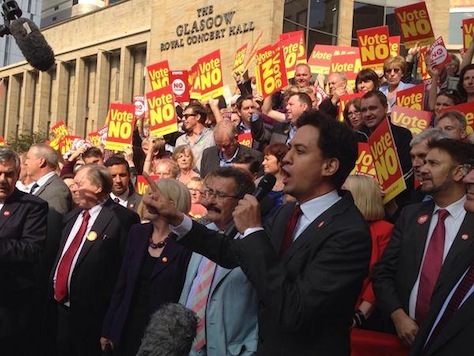 Cameron and Brown dominated the last hours of the ‘Better Together’ plea for unity, not Miliband or Darling. Nor did other Labour heavy-hitters, like shadow chancellor Ed Balls, shadow home secretary Yvette Cooper or even the Glasgow-born shadow foreign secretary Douglas Alexander, seem to have much of an effect. Former prime minister Tony Blair, who was born and educated in Scotland, kept an incredibly low profile, given the unpopularity of his support for the US-led occupation of Iraq. Though Cameron has had a rough time of the referendum, his loss wasn’t Labour’s gain. It was the failure of Labour to rally its own rank-and-file supporters across Scotland that ultimately made the vote so close. London wasn’t the only national capital breathing a sigh of relief early Friday morning. In Madrid, prime minister Mariano Rajoy is almost certainly very happy not to be dealing with a newly independent Scotland that’s just showed the way to Catalunya, Euskadi and other separatist hot spots across Europe, including Flanders (in Belgium), Corsica (in France) and parts of northern Italy. The Catalan threat is especially difficult for Rajoy, who, unlike Cameron, has refused to recognize calls from the Catalan regional president Artur Mas to allow a referendum on Catalunya’s status. 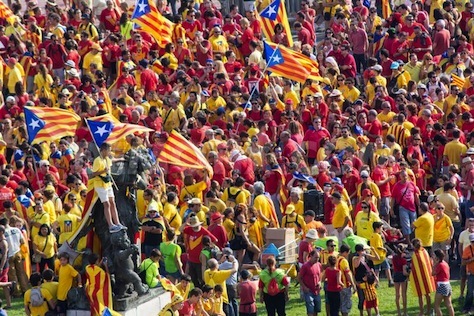 Nevertheless, with the overwhelming support of the Catalan parliament, Mas hopes to hold an independence referendum on November 9, with or without Mas’s support. The gradual path from 1997’s devolution to yesterday’s referendum gives Catalan nationalists precedent enough against a central Spanish government that stubbornly refuses to engage its constitutional problems. 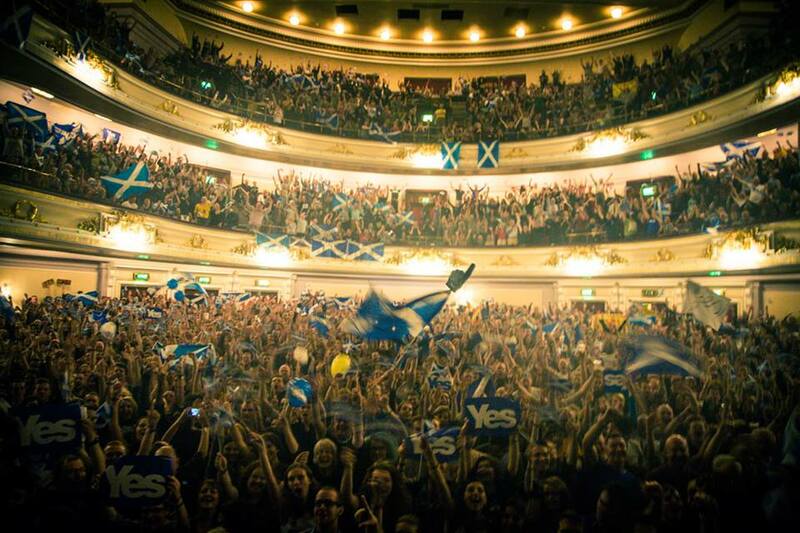 But a ‘Yes’ victory in Scotland would have doubly emboldened Catalunya and nationalist movements throughout Europe. Cameron and Miliband aren’t the only national losers. The Liberal Democrats may have been assured of victory in the Orkney and Shetland Islands, which have reliably voted Liberal or Liberal Democratic since 1950. Yet if the referendum made Cameron look desperate and Miliband impotent, the deputy prime minister was simply invisible. That may have been a boon to the ‘No’ campaign, because Clegg has become such a millstone to his own party that it’s a miracle to believe he will be leading it in the next elections. It’s not rare for junior partners in government coalitions to suffer, even when the senior partners win reelection. Just ask Germany’s Free Democrats or Ireland’s Labour Party. 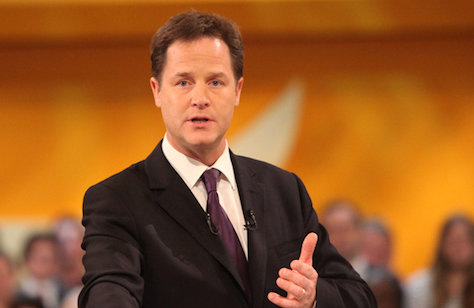 But a YouGov poll dated September 14-15 puts the Liberal Democrats at just 8%, with UKIP winning a stunning 15%. No wonder Clegg’s been such a non-entity in this referendum. It follows the massive defeat that Clegg suffered in May 2011 after forcing the government to hold a referendum on the ‘Alternative Vote,’ a form of instant runoff voting. In that election, Clegg and voting reform proponents lost by a margin of 67.9% to 32.1%.